Anyone built or running one ? Plan is stage II Buick V6, Super Turbine 300 trans, with manual vb./trans brake. 9" ford, probably wheelie bars with coil-overs. Tubbed and some f-glass, around 2k lbs.? 9's ? Thanks, roverman. 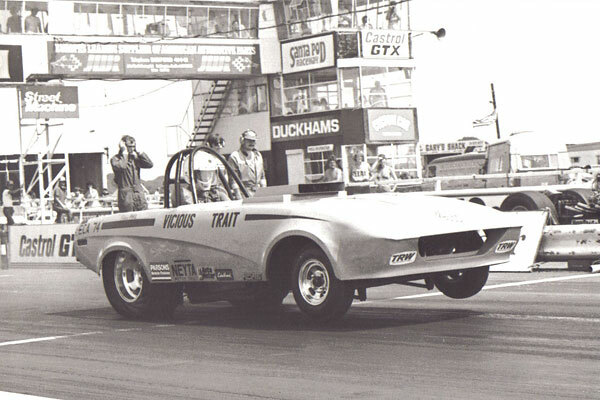 Re: TR7- just for drags/ too short, watta drag ! NHRA says minimum 90" wb. In others words, stretch the TR 7 at least 5", not worth it. I've been wanting to build a tranverse/mid-engine. Porsche 914 is a better platform, 96.5" wb, etc. Cheers, roverman. There is one in England. Pops the front wheels all the time. Is NHRA the only game in town? We only have a couple drag racing wedges in our gallery, but I know a bunch more exist or existed in the eastern states.